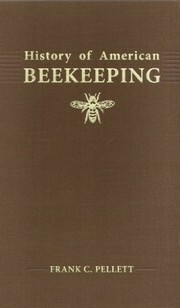 1 edition of History of American Beekeeping found in the catalog. Add another edition? Are you sure you want to remove History of American Beekeeping from your list? Published 2013 by Wicwas Press . Reprint of the 1938 classic. Pellett reviews the development of beekeeping ideas, equipment, tools and processes. There is considerable attention to Langstroth, Doolittle, Root, Dadant and other industry pioneers. Hive types, smokers, extractors, queen rearing, beekeeping organizations and much, much more! January 24, 2016 Edited by David Foti Edited without comment. January 24, 2016 Created by David Foti Added new book.